In this segment of Health in a Handbasket, Emily Kyle from the American Diabetes Association explains the many health benefits of Wild Blueberries, including a recipe for gluten-free blueberry corn muffins. Ten chefs from across America visit Maine to explore Wild Foods and compete in an “Eating on the Wild Side” Chefs Challenge, featuring Wild Blueberries, and arranged similarly to the Food Network show Chopped. Two registered dietitians recommend using Wild Blueberries to help get more antioxidants into your diet and help you beat the summer heat . Last month, schools in 19 states placed orders for 1.25 million pounds of Wild Maine Blueberries. 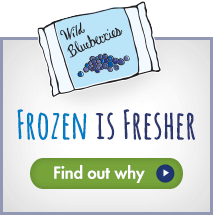 Federal data show that more frozen Maine blueberries were sold to schools in April than in all of 2016. Lewiston native Nancy McBrady, executive director of the Maine Wild Blueberry Commission, will give a free talk from noon to 1 p.m. on Thursday, May 18, in Callahan Hall at the Lewiston Public Library about the state of the Wild Blueberry. Federal grant helps boost exposure and use of Maine Wild Blueberry in school foodservice across the country. Not just for breakfast anymore, Wild Blueberries are making an appearance in a variety of meals at schools. Riding on the growth of sweet-and-tangy flavor mashups, fermented and pickled foods are making a comeback on menus. In the coming school year, wild blueberries will be served in public schools in 19 states.